The audio visual installation helps interpret 1,000 stories spanning 100 years for the Navy in the new Babcock galleries. These galleries focus on the people of the Navy, their experiences and lives. 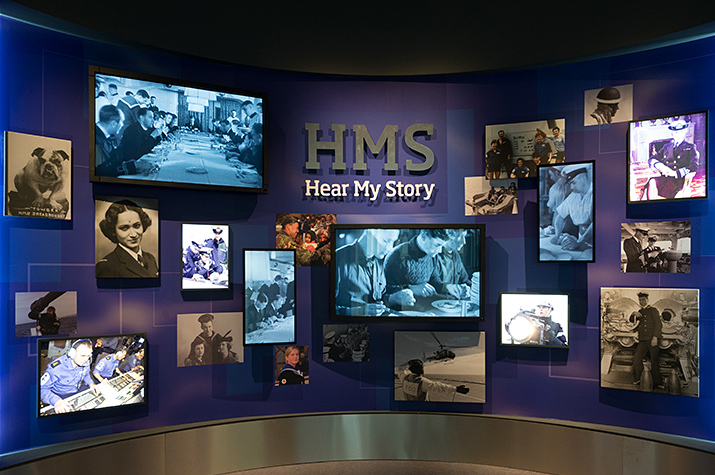 The centre piece audio visual exhibit is a multi-touch timeline where multiple people can bring up photos, text and video footage of people and ships from the across the history of the Navy. Six 46” screens form a single sleek table with naval vessels flying and sailing across the table. An impressive cooling system running through the slim table extracts all the heat from the screens. Another particularly interactive area of the exhibition encourages visitors to vote on more contentious issues related to the Navy. Votes from eight voting stations are collated by three micro computers and sent across the network to the interactive PC. The micro computers also control the voting button lights – flashing them at voting time and to attract visitors to the area. 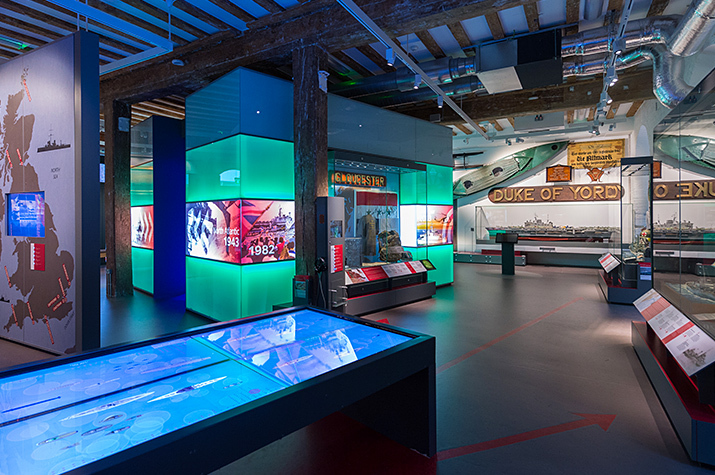 In an immersive exhibit, floor to ceiling projection and surround sound shows what it was like to be involved in actions from the Battle of Jutland in 1916 to the Falklands War in 1982. Visitors can choose to have this subtitled; elsewhere, while watching archive footage and interviews from contemporary projects, they can choose subtitles and British Sign Language. Interactives let visitors hear more of the stories of those who have served, as well as discover where the Navy is serving right now, in updatable databases. 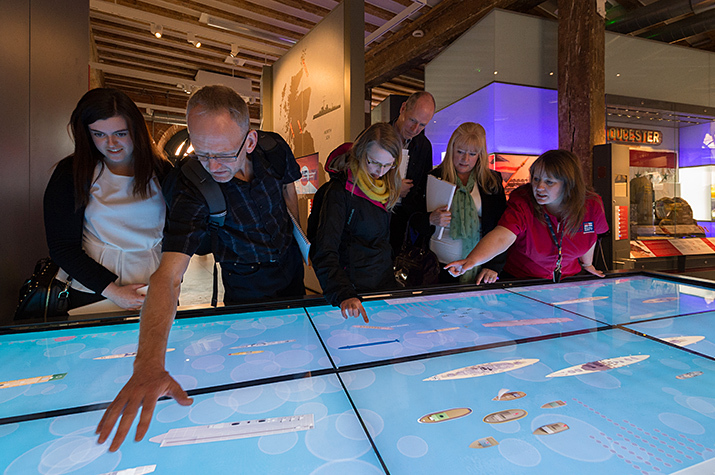 Visitors explore the stories of ships on an extra-large touch screen. This is a great resource for educational groups, as well as being fascinating for the general public. Footage of the people in the Navy is displayed throughout the gallery, here as looping footage welcoming the visitor. 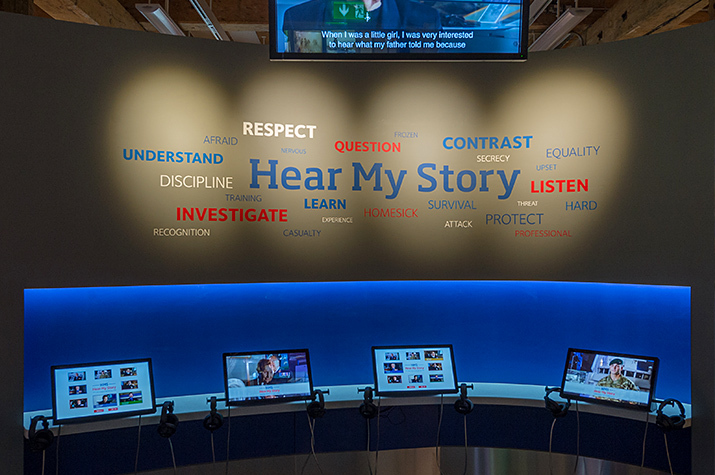 Visitors can sit down to make a more in-depth discovery of stories at these touch screens.